Below are the best poker sites for 2019 . Each poker site accepts all players (including USA), and allows you to play poker for real money. Our poker reviews are broken down into a few categories. You can find game specific information relating to real money games for Hold’em, Omaha and even Razz. Likewise, our guide offers players comparisons to some of the top ranked poker sites. You can find individual pages where we break down the software, game traffic, competition, compatibility, payment processing and more. Our reviews allow you to compare one room to the next and even include video reviews, which allow you to view the software before downloading. Accept all players (including Americans, Canadians, Europeans, Australians, and all others). Allow you to play online for real money (if you wish). Offer exclusive bonuses to players who use our "referral codes". By using the codes listed in the table above (or the yellow/blue links on the right) , you are guaranteed to receive the corresponding bonuses at each poker site. If you don't know what these "bonuses" are, don't worry - we explain it on another page, which we link to later. If you would like to know a little more about the sites above before you make your decision, that is perfectly understandable. To read all-access, unbiased reviews of all of the major poker websites, head on over to our Poker Site Reviews section. The page lists 20+ reviews of poker sites, and also offers specific toplists such as the "Easiest to Beat Poker Sites" and the "Best Poker Bonuses" (that page is a great one to read if you would like to learn how poker bonuses work). We also have recently added video reviews of our ten favorite poker sites including our favourite poker sites for USA players. (like our special Party Poker bonus code). To read full reviews of our six favorite poker sites, click the links below. Or, check out all of our poker site reviews. 888 Poker Review - scored a 95.5% in our review. BetOnline Poker Review -( USA Players Accepted) scored a 92% in our review. Party Poker Review - scored a 91.2% in our review. Bwin Poker Review - scored a 88.8% in our review. The first thing that new players need to understand is the concept of an "online poker site". If you have only played poker in a live casino before, playing online can initially seem like an entirely new experience. However, the thing that's funny is online poker is basically exactly the same as live poker - all that is different is the location. In live poker, players fly or drive to a casino, and walk through the casino to find the poker room. In online poker, players browse the Internet to find a poker site, then download the software to open up the online poker "lobby". In live poker, players sign up on a board to find the table they want, then buy chips. In online poker, players scroll through the lobby to find the table they want to play, then buy chips with a credit card, eCheck, or eWallet (online poker deposit information available here: Poker Depositing). In live poker, players sit down at their table and a live dealer runs the game and deals the cards. In online poker, players double click a table to open it, then sit down. A virtual dealer runs the game and deals the cards. In live poker, when you are done you go to the cage to cash out your chips. In online poker, when you are done you go to the "Cashier" and can cash out via check, wire transfer, or eWallet. Everything really is the same! USA Poker Sites - Learn about the best poker sites that accept American players. Texas Hold'em Poker Sites - Find the best online poker sites for playing No Limit Texas Hold'em. Poker Sites with Tournaments - Play at the best poker sites for multi table tournaments. Game Specific Poker Rankings - This is a group of toplists for all the major poker games - i.e. the "Best Omaha Poker Sites", the "Best Sit and Go Poker Sites", etc. By now you should have plenty of information to help you choose the best poker site, so we are going to move on to our other poker related content. However if you dont find what you are looking for, check out this US Poker Sites listings and information about how rakeback works. One of the larger sections on our websites is our poker rules guide, which lists the rules for over a dozen poker games. Some of the more popular pages in that section include the rules of Texas Hold'em and the rules of Omaha poker. If you would like to find more info about poker rules, a few other poker rules sites have even more variations than we do. If you would like to find out more about poker games this poker sites portal lists over 20 rules and variants e.g Omaha, HORSE, Stud, Texas Holdem, RAZZ and 7 Card Stud. No Limit Hold'em Strategy - Learn strategy for the most popular poker game, NL Hold'em. Poker Tournament Strategy - We teach you how to go deep in MTTs at the biggest online poker sites. Heads Up Strategy - This page lists strategies for beating opponents 1 vs. 1. Omaha Poker Strategy - Omaha is an up and coming game, and we list the best Omaha strategies. Seven Card Stud Strategy - Although Seven Card Stud is an old poker game, the strategy is still useful. Sit and Go Strategy - Learn how to crush sit and go's and move up in stakes. General Strategy - This page lists general strategy pieces that didn't fit in the other categories. We're planning on adding more strategy sections in the future, so make sure to check back often. In addition to our poker strategy articles, we also have poker strategy videos. These videos are almost 100% focused on sit and go strategy. Our resident pro walks you through a sit and go while explaining his strategy, thoughts, and moves. By seeing a winning player go through the motions, you can help your game immensely. PokerSite.org was launched in 2008, and has grown significantly since the early days. I'm Mike, and I own and operate the site on a daily basis. The main goal of PokerSite.org is to recommend the best poker sites, and I should disclose that the online poker sites do pay me for listing them on this site. However, I always do my best to stay unbiased and think of the players first. I've been creating online poker websites for over four years now and I used to play online at poker sites like PokerStars and Bodog Poker, but now I don't have as much time to play online. I still play occasionally at live casinos near my home. 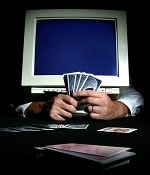 If you would like to learn more about myself and the PokerSite.org team, read our About Us page. Or, if you have questions or comments on the site, contact me.